(i) By Hand for 1500/- ( One Thousand & Five Hundred Only) for General/OBC Categories & 1300/- ( One Thousand & Three Hundred Only) for SC/ST Categories between 09:30 A.M. to 03:00 P.M. on all working days from Monday to Friday upto 25.08.2014 to 24.09.2014. (ii) By Post for 1550/- ( One Thousand and Five Hundred Fifty onl y) for General/OBC Categories & 1350/- ( One Thousand & Three Hundred Fifty only) for SC/ST Categories along with a self addressed envelope of 10" X 8" upto 12.09.2014. (iii) Fee is exempted for persons with Disability (PwD). Note:- SC/ST/PH Candidates are requested to bring/ send a copy of the Caste Certificate/PH Certificate for obtaining Bulletin of Information. Money in cash will not be accepted in any case for supply for Bulletin of Information. 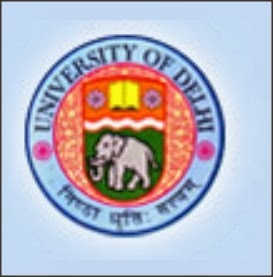 (i) The candidate must have passed the degree of Bach elor of Homoeopathic Medicine & Surgery (BHMS) from the University of Delhi, or from any other Univ ersity established by law and recognized by Central Council of Homoeopathic in cluded in the Second Schedule to the Act, after undergoing a course of study of not less than five years and six months duration including one year compulsory internship which must be completed by 31 st July and should have obtained permanent registration from the Board of Homoeopathic System of Medicine. (ii) Bachelor of Homoeopathic Medicine and Surgery (Graded Degree) or equivalent qualification in Homoeopathy included in the Second Schedule to the Act, after undergoing a course of study of not less than two years duration. Application Form may also be downloaded from websites www.du.ac.in , www.fmsc.ac.in & www.nhmc.delhigovt.nic.in and submit the same duly filled in and complete in all respects with requisites Demand Draft, to the office of the Deputy Registrar, Faculty of Homoeopathic Medicine, 6 th Floor, V.P. Chest Institute Building, University of Delhi, Delhi - 110007 on or before 24.09.2014.